Darkness music a big hit. Even if you don't want to hear it. Every Stars fan has a favorite tradition during home games at American Airlines Center. Whether it's the unique goal horn that is certainly one of the loudest in the league, fans in unison yelling, "STARS!" when it comes up in the verses of the national anthem, or celebrating a Stars goal with "HEY!" during Rock n Roll Part II. During the Stars' first season in Dallas (1993-94), Ty Wubker was building a play list of songs and music to use throughout Stars home games at Reunion Arena. It was then that Ty discovered an unnamed piece of music that he thought might have a place in the Stars' game presentation. "We have no idea who created it or who it is by," said Wubker, the man behind most of the music you hear at Stars home games. "When we moved into Reunion Arena the first season, the computer had about 25 things on its database that were used for effects -- sound bytes, organ music and things like that. And this music was one of those things just sitting there on the computer. We started loading in music as the first season started and built a play list." Wubker cannot remember the exact date that the Darkness Music made its debut, but it was somewhere midway through that first season in Dallas. "As the season went on, I tried to figure out a specific song or piece that I could play after the other team scored," Wubker said. "We needed to play something in the arena after an opponent goal and obviously it was a negative to be scored upon so it needed to be something low-key. I just did it on my own. It seemed like a good fit and I just kept doing it after goals and it became a tradition." Wubker would confer with Stars marketing people daily and they would discuss all aspects of the game presentation and always had different suggestions on what music to incorporate into the show. But one thing that seemed to not need changing is the music played after an opponent goal. "No one really said much about it; I just kept playing it," Wubker said. "The first real feedback was on (Sports Radio 1310) The Ticket from The Hardline. I got them a copy of it and they joked that it should be dubbed 'The Darkness Music' because of when it was played. It kind of just took off from there and we stuck with it." Since then there have been rare moments when the Darkness Music was not played after an opponent goal. "There's been a couple of times where I didn't play anything at all," Wubker said. "I try to go with it as much as I can unless it's something that's a really different situation or a very important goal. Overtime game-winners were sometimes followed by silence. I know for a fact that when (Jason) Arnott scored the Cup-clinching goal for New Jersey in overtime in 2000 I didn't play it. It's very rare that I haven't played it after an opponent goal. I still play it in the playoffs but I try and get out of it real fast and go into something else to kind of get the crowd back into it." One would think that the most common question given to Wubker by fans on the Darkness Music would be, 'What group or artist is that?' But people don't seem to care about who wrote it but rather how to get their hands on a copy of it. "The most common question I get asked about the Darkness Music is actually 'where can I get it?' As far as I know, you can't find it in a music store somewhere," Wubker said. "I have a copy of it on disc and obviously it is on the database at American Airlines Center." Those in the know claim that the Darkness Music has never been used at any other public function or sporting event at Reunion Arena or American Airlines Center. It has developed a life of its own and is identifiable with one thing. "The Darkness Music was one of the those impromptu things that Ty came up with that represents the instantaneous disappointment Stars fans feel after giving up a goal," said Stars Executive VP of Sales & Marketing Geoff Moore. "While it has become a tradition for us at our games, it has become so ingrained in the subconscious mind that when I hear it on a drop on the Ticket, it actually gets me depressed for a second or two. If I'm in the car I try and keep both hands on the wheel to keep from veering off the road. "I hope I never hear the entire piece of music at one time, for I fear that it would drain my life force." The Darkness Music has become so identifiable with an opponent goal, that Stars fans and staff alike know what has happened on the ice if they are not in the arena bowl to see the action, but are close enough to hear the music. "There have been times that I was in the tunnel near the bench conferring with a player and I heard the music," Stars Head Athletic Trainer Dave Surprenant. "We'd give a quick glance to each other with that look of disappointment. We both knew what had just happened." As much as we hate to hear the Darkness Music, rest assured it is bound to remain a Stars tradition for seasons to come. 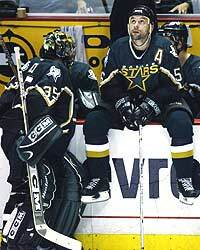 "No one ever wants to hear it but it's become a staple for Stars home games," Wubker said. "I can't imagine playing anything else."